I tell you what, these Nordic Ware Bundt pans, don’t half look fantastic! This recipe uses the Nordic Ware Heritage (10 cup) pan and it’s certainly my favourite. Now on the surface these lovely Bundts look easy to make, and in some ways they are. But it is all down to the preparation of your pan. If you don’t prepare the pan, it might not come out in one piece – or at all!. I find this the most therapeutic part of baking the Bundt. It has to be done and it can’t be rushed. I use very soft butter, not melted and brush the entire inside of the pan carefully, ensuring that every crevice and curve, is lightly coated in butter – no lumpy bits mind! Just a smooth coating. This then is dusted with flour – I use about 2 tablespoons of gluten-free flour sifted into the pan – tap and move the pan around so all the butter is covered, tap on a hard surface so that all the flour sticks. Then turn upside down over a sink and tap again, so that all the excess flour is removed. Set the oven to Gas Mark 3 and the shelf set, one level below the centre. Clearly if you using a convection oven it won’t really matter! Which is about 160c – 170c. But you know your oven. Mine is very temperamental!! Sift the flour, cocoa powder and baking powder together and set aside. Beat the eggs together with the vanilla extract, set aside. I melted the chocolate and milk in the microwave for approx 30 seconds and stirred to mix to a paste. But you could use a bowl, over a small saucepan, with simmering water, to melt the chocolate. Ensure the bowl does not touch the water, stir the milk in, after its melted. Which ever way you melt the chocolate, once it’s melted, stir in the peanut butter. Mix the sour cream with the double cream. Beat the butter and the sugar together until light and fluffy, get as much air in as you can. About 5 minutes in a food mixer. Then pour in the egg mix slowly and ensure all the egg is beaten in well. Ensure also that you scrape down the sides of the mixing bowl as you go. Then, beat in the flour mix, chocolate mix and the sour cream mix alternately. Approximately a third of each, at a time. Until all these have been thoroughly blended in. Spoon this mix then evenly in your prepared Bundt pan. Once all in, tap the pan on the work-surface so that the mixture gets into all the moulded pans’, crevices and curves. Bake for approx 50-60 minutes. Test with a skewer to ensure its baked, insert into the deepest part, it should come out clean. And now the other important part – ONCE REMOVED FROM THE OVEN – LEAVE TO COOL IN THE PAN FOR NO MORE THAN 10 MINUTES – SET THE TIMER. Once the 10 minutes is up, turn out of the pan onto a wire rack and leave to cool completely before decorating. To make the sauce, heat the cream and the milk in a saucepan, until just about to boil and pour over the broken chocolate. Stir until the chocolate has melted and resembles chocolate sauce. 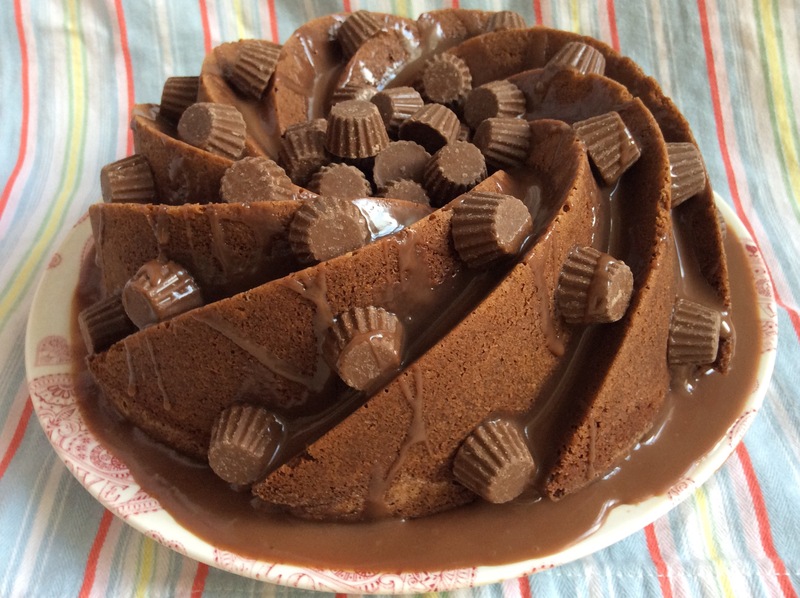 Leave this to cool for a couple of hours before pouring over the finished Bundt and decorate with the Mini Reese’s Peanut Butter Cups. We all need some, sometimes. But where do we look? There are plenty of inspirational ideas on-line of course – on-line cookbooks, online magazines, forums. And many of us have a plethora (ooh big word!) of cookbooks at home. 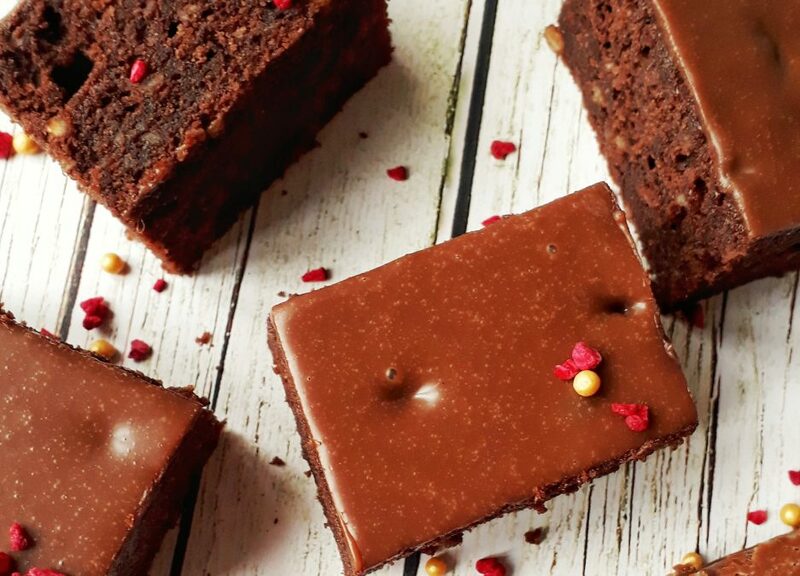 Some we use more often than not – for the quick and easy bakes, the trusty ‘go to’ books and bakes. But I’m sure there are those of us that have books we rarely turn to, rarely open. They’d seemed to be such a great idea at the time, tons of great recipes to wow our friends. But once opened we were so over whelmed we gave up. Too technical, to fiddly and ‘how much time do you think I have! !’ ‘I’ll save this for a rainy day’. Destined for the coffee table (if you are lucky to have the space) or the charity shop. Where someone else can have a go…. But sometimes you need that coffee table cookbook, sometimes it serves to inspire in a different way. Give yourself some credit, give yourself a moment to consider what you can do. Confidence my friend. Look at the recipe in front of you and see if you can’t break it down into manageable chunks. Bite size pieces that would make the bake easier to make. Believe. Try. Cook. Besides, if at first you don’t succeed…. There is certainly an element of that with Gluten Free baking! More recently though, I have been finding inspiration from those around me. I bake because I thoroughly enjoy it. I enjoy see the bake disappear with friends and family. I bake because I don’t want Noah to miss out. And why should he. He gives me the inspiration to bake something new and interesting, something good enough to put his name to, to be proud of. But there are others. There is a core of fellow bakers on Twitter, whom I would be lost without. A little too numerous to mention, but I’d like to think you know who you are – so ‘thank you’, in a big way. We might get a little competitive, but I think in a friendly & healthy way. It’s that competitive spirit that continues to inspire on a weekly basis. 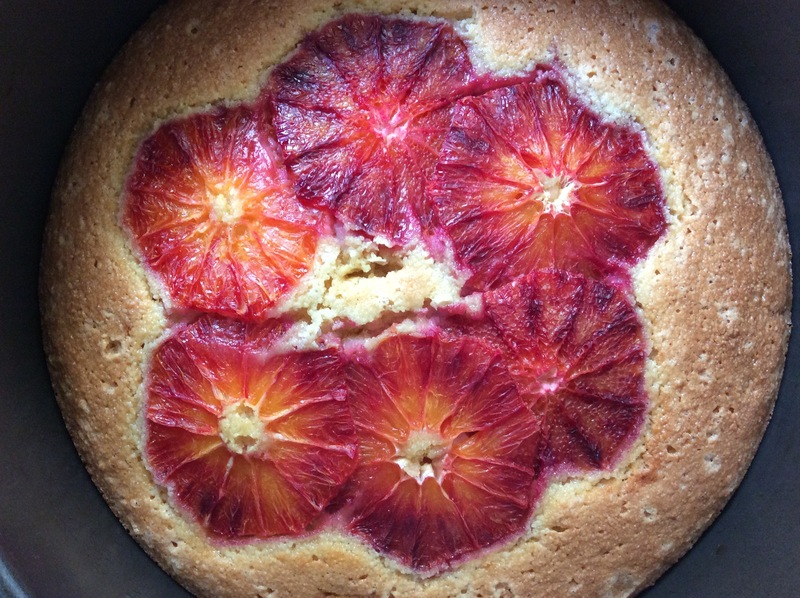 To try to find the bakes that are slightly different, yet not too wacky, to ensure you get the RT’s and the favourites. To bake the challenges and the tasks, technical or otherwise, that help concentrate the mind. That inspire you to continue to find ‘that’ bake. And I guess it then comes to those that set the challenges. That they in turn inspire those out there in Twittersphere. And to you a ‘salute’ a ‘thank you’. It can’t be easy, every weekend, RT’ing & favouriting every tweet that comes through. Ensuring a fair game for all. And then having to choose a winner! I do not envy you that task! It must be a nightmare?! But you manage it well and again, ‘Thank you’. I’m sure there are plenty out there, but for now thank you …. It’s not as easy as ‘1-2-3′. You might think it is, I would disagree. There have been countless failures. On most occasions I have just had to throw the batch away. Runny cookies’ that become just a tray of ‘something’, sponges that sink in the middle, biscuits that are so greasy, I have no idea what went wrong. I have even, on one or two occasions, passed these around to those (un)lucky enough to be around. They have always told me they would eat the cast-offs anytime, and please make more mistakes like this! But it’s never been quite right for me. And I’m sure they were only being polite! Gluten free flour is a mix of flours. Some have their own blends that they use, a bit of this and a bit of that. It’s almost witchcraft or alchemy! Some will share the success and others keep it close to their chests. Guarded secrets handed down, kept under lock and key. Potato flour, rice flour, tapioca, maize, buckwheat, polenta. It becomes a science in its self. All have different properties, all add something to the blend you need. But how much of each and what are you baking/making? You need to bake the cake, go through the whole process; mix, bake, cool, eat. In order to taste the finished bake, and then find out what you will do different next time to make it taste better/edible. Me? For now, I stick to a well used branded gluten-free mix, that works for me. Dove Farm – plain flour, white bread flour and their rice flour. Thank you Dove Farm 😊 You have taken the pain and stress out of what would have been, months of fine tuning. That’s not to say I won’t work out my own blend, but for now it’s all I need. Today was such an occasion though, that through some heavy tweaking, prior to mixing, I have converted a recipe successfully! Yay for me! But such as I am, it’s probably a fluke and will never be the same again….. 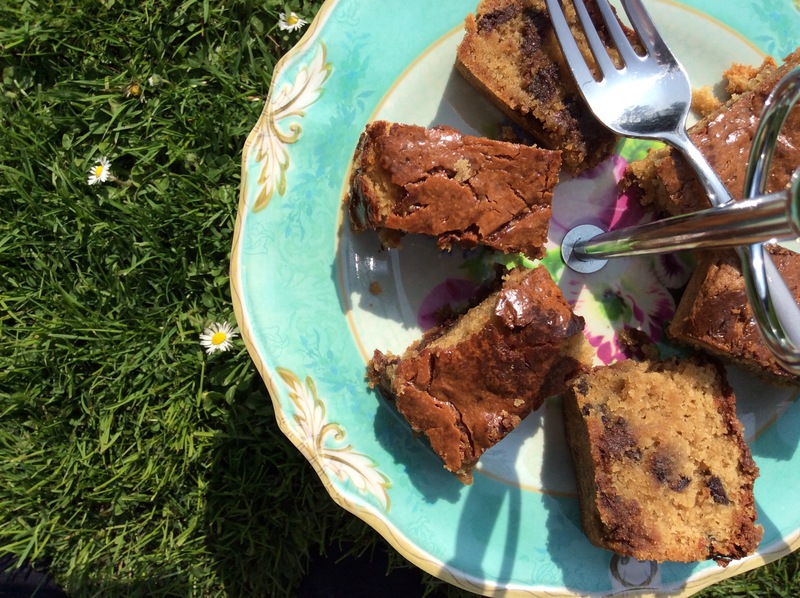 These Chocolate Chip Cookie Bars are from a recipe that I have tweaked, from The Hummingbird Bakery cookbook ‘Life is Sweet’. And so the story continues and turns a new corner. Cakes by Noah was started to fill a gap. That ‘gap’ was wide and all-encompassing. Our son – Noah – was diagnosed with Coeliac Disease in 2012, after months of frustrating return visits to the doctors, and one continued poorly boy. The mis-diagnosis of this and that, finally led us to a Osteopath and an eventful afternoon in his surgery! And then the fun really began! As a chef I have always been (and here in lies the honesty) a little sceptical of allergies and intolerances. But until it actually happens to you or those around you, you love and cherish, you tend to carry on. But oh how that view changes very, very quickly! After diagnosis and being given the go ahead from the dietician, we began to adapt the diet of us all – it would be far easier for us all the eat with Noah than to provide separate meals. Although as it turned out, cooking separate meals was easier sometimes! What we were buying wasn’t great. Sorry Mr & Mrs Supermarkets, but dry, crumbly, broken, bland and tasteless are words that sprung to mind. I could do a lot better. So I got on with it and baked a better cake! And lots of them! So now I can also start to share these cakes with you, the reader. And the blog begins. And perhaps it should have started sometime ago..